Italy's network of inexpensive rifugi (mountain huts) make mountain hikes and Alpine treks easy to stretch over several days. The Rifugio Orestano (www.rifugiorestano.com), a mountain refuge built in the 1920s on the Piano Zucchi (3646 feet above sea level) in Sicily's Parco delle Madonie. Picture a hostel with Alpine flair: cozy bunks with thick blankets, hearty food (if offered), a common room filled with ruddy-faced outdoorsy types, and killer vistas. Italy's alpine huts range from woodland hostels in the low hills of Sicily to the Alps' Capanna Regina Margherita atop Monte Rosa (www.monterosa4000.it), Europe's highest mountain refuge at an oxygen-starved 14,941 feet. Just what is a rifugio mountain hut? Mountain refuges and Alpine huts are a bit different from full-service campgrounds. Some are a kind of Alpine hostels, scattered along winding roads. Others are glorified cow sheds in places you can't get to without hiking a few miles (if not all day), where you can shack up for the night whilst trekking across the Alps, Apennines, Dolomites, or other mighty Italian mountain chain. 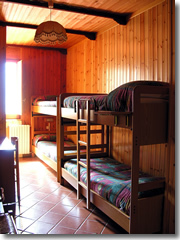 A bunk room at the Rifugio Orestano.Some really are just huts: wooden single-room structures with a woodpile by the door and a cot in the corner. Most, however, are run as sort of high-altitude hostels (only ones used by a handful of hard-core hikers, not crowds of party-hearty backpacking students). Many are only open during the summer hiking season (usually June to late September), though some set aside a handful of beds for year-round use. Though a mattress and blanket are provided, you must also bring and use your own sleep sack or sleeping bag (this is for cleanliness and environmental reasons, as it reduces their laundry load). Make sure you stay in a full-fledged rifugio; the other lodgings up in the rarefied air are bivacchi, bare-bones shelters for folks caught on a peak in inclement weather or on long trails between rifugi. How much do rifugi in Italy cost? 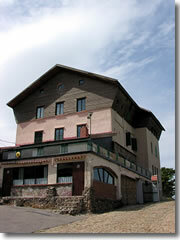 Club Alpino Italiano (www.cai.it) is the premier Italian association geared toward aiding hikers and walkers. Membership also usually gets you discounts at Italy's network of mountain huts. By law, per-person rates cannot exceed €20–€26 in a dorm (rooms with 2–6 beds may charge more, up to €43 per person). CAI members pay about half that (you can apply to any local CAI group; usually €50–€65 for the first year, a bit less for those under age 30). In practice, most huts charge less than the max, around €16–€19 (breakfast may be free, or a modest extra). If offered, half-board (breakfast and dinner) adds €10–€30. Huts that remain open in winter (Dec–Apr) may charge non-members a 30% premium for heating. At some of the more isolated rifugi (and most bivacchi)—which are frequently unstaffed—all you are asked is to leave a small donation. A few of the most basic bivacchi are completely free of charge. Italy's premier mountaineering organization, Club Alpino Italiano (cai.it), owns 600 rifugi (alpine huts) and maintains an online database at rifugi.cai.it. However, this is woefully lacking in data (many refuges now have Web sites, a fact rarely included in the database). Far more useful are the regional CAI associations. You can find these by staying in the Italian-language version of the main www.cai.it (rather than the stripped-down English language version) and clicking on "Le Sezioni del CAI" in the left menu; the clickable map of Italy will direct you to regional CAI groups. The Italian equivalent to AAA, the Touring Club Italiano (www.touringclub.it), publishes several books of mountain itineraries (the "Guide Monti Italia" series) with info on the huts used. The Rifugio Nino Pernici—outside Bocca di Trat in the Trentino—is proof that you don't have to hike far to find a mountain refuge that feels isolated amid the glories of nature, yet is still just a few hours' hike from one of Italy's top destinations—Lake Garda, largest of the Italian lakes and beloved by windsurfers and sailors across Europe. Set against the high, toothy cliffs of the Ledro Alps, at 1,600 meters (5,249 feet) and a 20-minute hike from the nearest parking lot, the Nino Pernici offers cheap, filling lunches and 30 Alpine-cozy beds to passing hikers. €18.50 per person for just a bed (plus €5 if you take breakfast), €46 per person for "half-pension" including breakfast and dinner. As at most rifugi, the beds are tucked into dorms sleeping four to six. Alpine huts, you see, are communal affairs, with Italian hikers and German mountain bikers cramming in cheek by jowl at the dining room's long picnic tables, sharing tips as they pass the bread. Meals consist of simple, rib-sticking fare designed for folks planning to climb a mountain in the morning: spicy pasta, gnocchi with mushrooms, polenta with goulash or rabbit stew, grilled pork and sausages, and beans or sauerkraut—at the prices of the cheapest trattoria (€6.50 to €7 for pasta, €10.50 to €15 for meat dishes, €8 for a liter of house wine). The rifugio Nino Pernici snuggles into the Bocca di Trat pass at the crossroads of several mountain trails that look modest but boast an impressive historical pedigree. For millennia, this pass was only way through the Ledro Alps, its ancient path tramped by prehistoric tribes, Roman legions, medieval pilgrims, French soldiers fighting Imperial troops in the 18th century, and Garibaldi's Red Shirts on their march to unify the modern state of Italy in the 19th century. The refuge was built in 1929 on the ruins of World War I barracks and named for one of that war's local heroes, who fell in 1916 on the Isonzo Front (the setting for Hemingway's A Farewell to Arms). The rifugio was restructured in 1990, and in July 2008 manager Corrado Valentini finished a multi-year renovation that added more windows to let in light and mountain vistas, modernized the kitchen, sheathed the interiors with an appropriately Alpine woody décor, and, most important, better fortified the building against cold weather. The refuge can now extend its regular season—daily June 20 to September 20, weekends only in May, June, and October—into the winter, remaining open on Sundays (and the occasional Saturday) though early March. There are trails to the refuge from two access points. Coming from the west, it's about a 20-minute hike (and only a 315-foot elevation gain) from the closest parking at Malga Trat, an 8km drive from Bezzecca (in the Val di Ledro, just northwest of Lake Ledro). Arriving from the eastern, Lake Garda side, it’s a bit farther from Riva del Garda—and a stiffer hike of an hour and a half up 1,800 vertical feet; the trailhead is in Malga Grassi, 15km northwest of Riva.